Can you use podcasts in your classroom? Absolutely! Podcasts are the perfect medium to help students practice listening comprehension skills, explore stories and learn more information. I’m very excited to share Circle Round, a wonderful folktale podcast for kids! If you’re a regular reader of my site (sign up here), you know that I’m a big fan of podcasts. There are lots of reasons to incorporate this type of media into your classroom. From informational text to literature and poetry, the possibilities are endless! Rebecca Sheir, the host, writer and producer behind the Circle Round podcast reached out to me a few weeks ago. 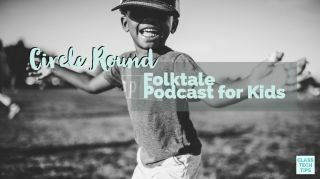 Circle Round is a children’s storytelling podcast that shares folktales tailored for a modern audience. With dozens of episodes, you can jump in right away and listen to them in any order. I recently listened to “The Unwelcome Guest” and absolutely loved it! I had lots of questions for Rebecca, and she was kind enough to provide answers. I’m excited to introduce you to Circle Round and share a bit more about the story behind the podcast. At the very bottom of this post, you’ll find links to listen to this free podcast! Ready for more reading resources? Download this poster with more favorites. Jessica Alpert, a phenomenal producer at WBUR (Boston’s NPR news station), is the one who first inspired us to launch Circle Round. I’ve had the pleasure of knowing Jessica for many years now. When she learned that my husband (composer/sound designer Eric Shimelonis) and I had launched our own audio-production company, Sheir and Shim LLC, and that at the tail end of 2016 we’d relocated from Washington, D.C., to the Berkshires — not far from Boston — she told us about her long-held dream: to make WBUR’s first-ever child-focused program. She envisioned a storytelling podcast that would take on a kind of radio-play style. Replete with an engaging host, dramatic scripts, gifted actors, and top-notch sound design and original music. She asked if Eric and I would produce a pilot episode. Jessica and I collaborated on the script, Jason Alexander signed on to play our lead, and the rest is history! Wow – with so many Circle Roundepisodes to choose from (nearly 40 at this point! ), it’s hard to pick! But if I had to choose, I’d recommend the episode that’s most recent as I’m answering these questions right now: “The Unwelcome Guest.” Versions of this tale originally come from the Middle East. It’s one of many stories featuring a character named Nasruddin: a wise man who lived long ago. Every Circle Round episode features at least one well-known voice from the stage, screen or airwaves. This time the star is Richard Kind. Most recently, Richard starred in the Amazon series Red Oaks, and Pixar’s Inside Out (Bing Bong forever!). You’ve also no doubt heard his voice in A Bug’s Life and Cars. On TV, his career goes back to Spin City and Mad About You, all the way up to Curb Your Enthusiasm and Gotham. On stage, the Drama Desk Award winner and Tony nominee has starred on Broadway in The Producers, The Tale of the Allergist’s Wife, Candide, and Bounce, among others. Richard put every ounce of body and soul into capturing and embodying this character. You can hear it in every line of dialogue — some of which he ad-libbed as we were recording! Sound designer and composer Eric Shimelonis uses a different solo instrument in every episode of Circle Round; for this one, he ordered an oud all the way from Istanbul! The sound of this stringed instrument is especially perfect for this particular story. Each episode of Circle Round helps listeners think about different values and issues relevant to their everyday life. I especially enjoy the way this tale helps people young and old think twice before judging a book by its cover. What do you hope students will take away from listening to your podcast? At the end of our episodes we always say: “Now, it’s your turn.” Now that the folktale is over, we invite our listeners to take part in a specific activity — telling a story, creating a dramatic scene, drawing a picture — that reflects on the themes in the tale they just heard. We invite them to share their story, scene, picture, etc., with someone they love (a family member, a friend). So another goal is to spark dialogue, and provide a way for children to make connections with others as they delve into virtues and themes that have been shared around the world, throughout history – from sharing and generosity, to persistence and imagination. Finally, our composer/sound designer, Eric Shimelonis, uses a different solo instrument in each and every story. You can hear an episode in which he and I actually discuss his musical approach here. This second season of the podcast, we name the instrument at the end of the episode, and include a special web feature about it. In that feature, we describe what the instrument is like and why we chose it for this folktale. We also include a photograph. So when students listen to Circle Round, we hope they’ll take away a heightened appreciation for music, instruments, and the art of underscoring an audio story. We include transcripts of every Circle Round script on our website. Teachers can cast students in different roles (characters and narrator) and have them act out each story. Another student or group of students could provide sound effects using everyday items in the classroom. We offer Coloring Pages for every story. Teachers can have students color these pages while they listen to episodes, or afterward. Alternately, teachers can ask students to create their own coloring pages, drawing whatever images resonate with them after the story is over! Budget: How will this project be funded? Will it be per-episode? Per-season? Who’s on staff? Is it just a host? Or are there writers, producers, editors, mixers, composers, etc.? Do you want to incorporate a preroll (message before the episode), midroll (message during the episode) or postroll (message after the episode) where you can sell advertising? Format: Will the podcast be interview-based? If so, how many interviews will you play per show? And would you ever interview more than one individual at a time? Alternately, will your podcast be more packaged and production-heavy: i.e., with scripted stories that include host/reporter voiceover and actualities (sound clips pulled from various interviews in the field)? Third option: would you make your show a combination of both…? Focus: Will each episode stand on its own? Or will the series be more serialized? If it’s the former, will each episode have its own theme? Recording equipment/Digital editing: What equipment will you use to record? Where are you going to record: in a studio, in the field, a combination of both? How are you going to handle the mixing/editing of the audio? Marketing: how will you spread the word? With hundreds of thousands of podcasts out there, how will you stand out… and get people to lend you their ears? And here’s a list of podcasts I hope to check out soon. Maybe when my toddler finally goes to college…? I hope you’ll listen to a few episodes of the Circle Round podcast and introduce it to your students this school year. In addition to streaming each podcast episode straight from their webpage, you also can find Circle Round on Apple Podcasts, Stitcher, or wherever you get your podcasts!